One of THE most important things to remember for those who are struggling to meet the recommendations for mama milk exclusivity: Breastfeeding does NOT have to be ‘all or nothing.’ If you cannot breastfeed but can express some breast milk, some is better than none for as long as you can. If you’re a full-time working mom who cannot nurse on the breast very often, it will help to breastfeed when you can, even if it’s only at night to put your baby to sleep, or only on the weekend to mostly dry-nurse, or something in between. Your baby is wired to count on your body (only yours!) to instantly take him back ‘home’ — back to your familiar scent, the sound of your heartbeat, your warmth, the perfect way you cradle her in your arms just like she was cradled in the womb. Just like in the womb. That is ‘home’ to a baby. Wearing your baby, practicing frequent skin-to-skin and safe co-sleeping are all great ways to let baby feel physically close to you if you don’t breastfeed. How you feed your baby isn’t quite as important as the fact that you do feed your baby and also not as important as making time to be physically close to your baby. Experts don’t recommend routine supplementary formula for babies who don’t need it because it can wreck a good milk supply, put baby at risk for health problems, cause emotional distress for mothers, and more. Some babies require formula supplements for medical reasons, but usually it’s a temporary solution so long as milk supply has been sustained through pumping/expression. Remember: you don’t need to explain to anyone why you aren’t exclusively breastfeeding (or providing breast milk at all) — you don’t owe anyone the inside scoop on what’s up with your body and why. Some women just straight-up don’t want to breastfeed. If you’re fortunate enough to be able to make a choice about it, make sure it’s an informed one. No! The only safe supplements for a baby under the age of one: human donor milk or commercial formula that’s been approved by a baby’s pediatrician. Serious nutrient deficiencies, allergic reactions, digestive sensitivities, and medical problems can occur with regular supplementation of these milks. Soy milk is not recommended for babies under the age of one due to the potentially hormone-disrupting properties of soy in very young babies, and cow and goat’s milk also come with a warning of avoidance for babies under one year (in part for the same reason). There’s a lot of fear-mongering carpeting the internet forums about commercial formulas. It’s true that when compared to breast milk, formula is inferior and its use does carry risk. However, it can act heroically in life-saving situations for babies and mothers. The risk of malnutrition and failure to thrive is greater for a baby under the age of one when feeding milk with an unregulated nutrient profile such as cow’s milk, goat’s milk, soy or nut-derived milks. Don’t believe everything you read on the internet — double-check and do your own research for second and third opinions when making decisions about your child’s health. *DISCLAIMER: I don’t support or encourage including homemade formula in a baby’s diet without the supervision and approval of a medical professional experienced both in infant nutrition and the baby’s development history. I include this only to facilitate any discussions with your doctor about whether homemade formula can be a healthy part of your child’s diet. The best supplement to a mother’s own breast milk, of course, is usually a healthy donor mom’s breast milk. But have you considered making your own formula at home? This method is NOT a good option for everyone. I cannot responsibly recommend making your own formula at home as there are risks and dangers involved with feeding an infant homemade formula. You should become aware of these before nicknaming yourself Chef Baby-Boyardee. Of course, there are risks and dangers involved with feeding commercial formula too, especially for individual babies with susceptible digestive systems or other unique health implications. Still, commercial infant formula can be an acceptably safe, nutritious product if manufactured, stored, prepared, and fed correctly. Homemade formula, in the same ideal conditions, can be safe and nutritious too. This is why I personally wouldn’t have been opposed to giving my own child homemade formula instead of store-bought if we’d ever gotten to the point of supplementing (most importantly, if I had a personal chef on call!). A baby’s diet is much too important to be solely inspired by Pinterest recipes and all the other ways we get inspired to whip up batches of market-to-home ingredients on our kitchen islands. Not really something too mess around with, you know? As always, it’s absolutely vital to discuss the matter of your baby’s diet with a licensed pediatrician or a pediatric nutritionist before floating down waters less traveled — not floating the internet (this site isn’t exempt!). I include the information below for educational purposes (maybe a bit of entertainment? That’s up to you). First, making your own formula takes more time than purchasing commercial formula, and it’s a challenge to make the necessary perfect batch every time you need it. Babies eat a lot, so that’ll be pretty often. Secondly, homemade formula cannot be assessed by a safeguarding, reliable third party for actual nutrition content. Malnutrition has been diagnosed in babies on a diet of homemade formula (scurvy, rickets, and anemia can also happen). Commercial formula undergoes testing (so we’re told) to ensure that it contains the correct balance and amounts of nutrients as stated on the label, thanks to regulations set by the FDA’s Infant Formula Act. The WHO and the United Nations Food and Agriculture Organization have outlined an international standard for infant formula here. (Though these standards only set strict rules for the minimum amounts and types of nutrients that formulas must contain, it doesn’t regulate formula sales, marketing, or manufacturing). Thirdly, as many of the recipes are meat-based or raw milk-based, cross-contamination is a concern, as well as spread of disease pathogens (pretty sure Mad Cow wasn’t on the intended menu). Also, I’ve yet to see any hard science or studies to support the value of using homemade formula (or to disprove its usefulness). Only time will tell if the research will reveal evidence stacked one way or the other. For now, it seems that babies who are fed homemade formulas are sorta guinea pigs in this scenario — sometimes to their benefit, and sometimes not. Finally, scratch-making infant formula at home is not a recommended practice by virtually any reputable health organization/authority. So why do people even bother with homemade formula? Many mothers feel more comfortable supplementing their breast milk with homemade formula as opposed to commercial formula. Sure, it may seem a little sketchy to put all her trust in her best friend’s great experience with homemade formula, but the alternative is putting blind trust in a corporation headed by businessmen and experts (not in medicine, but in marketing). Then, commercial formula is a heavily processed food and there are some unsavory ingredients that backpack along with the basic nutritious ingredients. It’s not unbelievable that parents would hope for an alternative to that alternative. 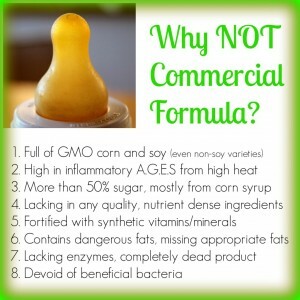 While improperly prepared homemade formula can contain too little of necessary ingredients and therefore be unfit for a baby, there is concern that commercial formulas often contain too much of necessary ingredients, which isn’t exactly safe either. The good news is it means you’re not alone if you supplement with formula. Most babies in the U.S. have had at least some formula. If you’re relying upon a combination of breast milk and formula, you can get formula/bottle-feeding advice from La Leche League Leaders who can help preserve your breastfeeding relationship and instruct you in correct formula preparation. Certified lactation consultants (LCs) are also well-educated in formula feeding. Not all LCs are alike though — if an ‘expert’ makes you feel guilty, ashamed, or stupid for supplementing, it’s totally a good idea to find someone who will check their judgements at the door and actually help you! Formula companies offer ‘helplines’ for supplementers and for those who wish to breastfeed, however I implore you to avoid dialing up Similac, Gerber, etc. for advice on balancing breasts and bottles. The information relayed may be technically accurate, but it won’t be entirely complete either. Check out the links below for help doing what you feel you need to, mama. Also check out my page on mixing nursing on the breast with feeding expressed breast milk. How much and how often should you feed your formula-fed baby?